Sunnyside-up or over-easy? In my book of rules, these are the only questions one should pose to anyone on a Sunday morning. I like it low-key, my eggs over-easy, copious amounts of coffee and the morning newspaper. Sunday mornings are filled with rituals such as this, whether the rituals are of a spiritual nature or caffeinated one. Yet scuttling the family to church, or stumbling down to the driveway to retrieve the Sunday morning paper, we all have to eat. Here’s the paradox: I have more time to make breakfast today but the pickins’ are slim. There’s no way I’m shopping so I have to make do. 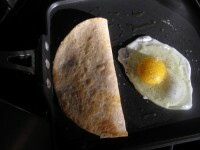 A breakfast tortilla-a simplified and lightened up version of heuvos rancheros, will be the ticket. I have some leftover pea shoots from the farmers market that need to be used. I included them in my breakfast but not in the recipe. If you’re lucky enough to have them, throw them in, or whatever other miscellaneous tidbits found in your fridge. I like my tortillas cheesy so use 1/2 cup of packed cheese per tortilla. Refried beans with melted cheese would be a great side as well. If you’d like both tortillas ready at the same time, use a large griddle if available or have two sauté pans at work at the same time. I just can’t handle all of that action on a Sunday morning. Besides, I may as well eat alone. I’m not very social until the paper is read. Combine chopped tomato, onion, cilantro or parsley. Set aside. In a large sauté pan, heat oil to medium heat. Place one tortilla in pan and sprinkle with 1/4-1/2 cup cheese, according to taste, placing a tablespoon of salsa in the center. 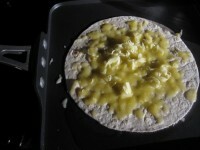 When tortilla is lightly browned on bottom and cheese is melted, about 3-4 minutes, fold in half. Crack egg next to tortilla, lightly season with kosher salt and freshly ground pepper, and fry until desired level of doneness; sunnyside-up or over-easy. 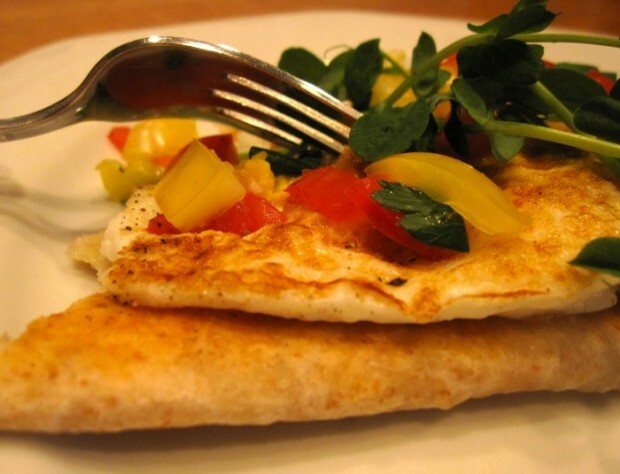 Serve egg atop tortilla and garnish with 1/2 tomato-onion mixture and serve.